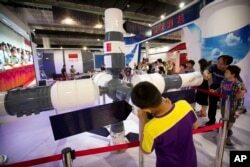 FILE - Visitors look at a model of China's Tiangong-1 space station at the China Beijing International High-Tech Expo in Beijing, June 10, 2017. China was excluded from the International Space Station largely due to concerns over its space program's connections to the military and U.S. legislation barring such cooperation. That didn't stop the country from launching its own space laboratory in 2011, named Tiangong ("Heavenly Palace"), which orbited Earth until last April.